If there was any doubt, it is now gone. Sometime later this year, probably in the Fall, Apple will deliver a 12-inch Retina MacBook Air. What we have here, the 2014 MacBook Air models, are modest speed and spec updates of the existing Apple ultraportable configurations. Perhaps best of all are the new lower prices. Cheap MacBook Airs? Not exactly, but any reduction is, of course, very welcome. 2014 MacBook Air baseline configurations now include a 1.4GHz (was 1.3GHz) Intel Core i5 processor and storage starts at 256GB (was 128GB). Apple’s BTO options list now tops out at 1.7GHz Core i7 chips, 8GB RAM and 512GB SSD storage. Interestingly, Apple is now advertising slightly better 2014 MacBook Air battery performance, specifically related to iTunes movie playback. Specifically, 11-inch models gains an hour of playback, from 8 to 9 hours, and 13-inch models, from 10 to 12 hours. 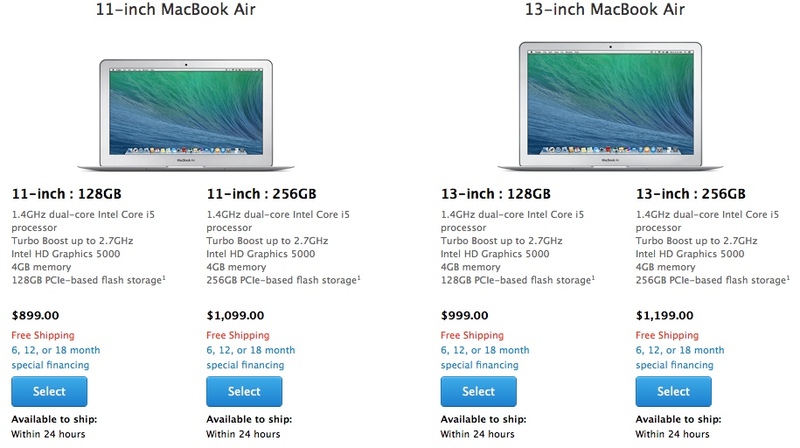 The biggest 2014 MacBook Air improvements are the modestly lower prices. Starting now at $899, Apple has trimmed prices by $100 across the board. All four baseline 2014 MacBook Air models are available immediately at the online Apple Store. Various rumors have posited limited availability at brick n’ mortar Apple Stores and third-party resellers. That said, a quick check of MacMall and MacConnection reveal the 2014 MacBook Air aren’t yet available at those resellers.